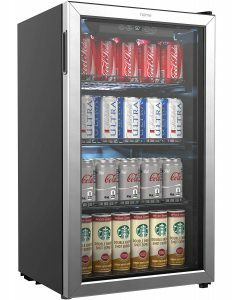 Stainless steel and black hOmeLabs Mini Beverage Fridge and Cooler has a capacity of 3.2 cubic feet or 120 cans of different types of drinks- beer, soda or wine. You can use it at home kitchen, dorm, office, restaurant, bar and RV comfortably with its decent capacity and removable shelves. It is a very popular and good quality product with an average score of 4.7 out of 5 stars by 179 customers at the time of this review. The sleek and transparent glass front door has a stainless steel frame and left hinge which can be installed as right hinge as well. You can see the contents, your beer, wine or soda cans and bottles clearly without needing to open the door, with the blue interior LED light. hOmeLabs Mini can be used both as an under counter and freestanding cooler. 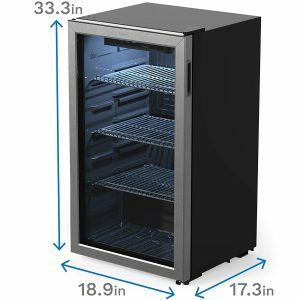 And as this is a large capacity fridge with three adjustable and removable shelves you can fit in quite a lot, either 60 standards sized bottles of white and red wines or 120 standard size soda or beer cans. You can put larger bottles or cans by removing or adjusting one of the shelves. Your beverages will be kept at the temperature you set the cooler to and at the right humidity. It has an extra temperature sensor for the automatic defrost mode. You may set the temperature via the up and down buttons on the control panel and the minimum it can get to is 33 degrees. The temperature range is between 33 and 50 degrees Fahrenheit. It has a memory function that goes back to the preset or last set temperature before the power outage or in case it is unplugged. This is a heavy duty vertical cooler with an 240 watt power (120V), very quiet and energy efficient modern compressor. There is a little convection fan inside that helps cool the interior quickly with the consistent air circulation. The internal dimensions are 16 x 29 x 12 inches for a 3.2 cubic feet capacity and the external dimensions are 18.87 x 33.25 x 17.30 inches including the door hinge that sticks up. It can be used as a built-in under the counter cooler as long as there is enough space (like two inches on all sides) for circulation. We do not advise you to keep food items or especially the perishable food items in this cooler as it is specifically designed for beverages as there is no air flow in that sense. The cold air will go the bottom due to the lack of the same type of air flow as in normal fridges. As an Energy Star rated cooler the annual energy consumption is reported to be 35 dollars, assuming a total use of 288 kWh. You can turn on and off the light as you want but it will turn on automatically when you open the double pane glass door. If you wish to change the temperature from Celsius to Fahrenheit or vice versa, you need to hold the up and down arrow buttons simultaneously. You should keep it away from the direct sunlight and probably not use it in a very hot room. Overall it seems to be very good value for money, especially judging by the real customer reviews and high ratings.